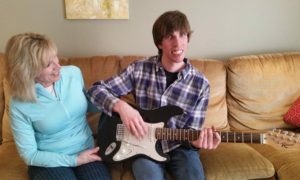 Ethan Pyke has taught his mom, Theresa Pyke, a thing or two about air guitar. Over the years, he’s also taught her the importance of inclusion. On Friday night, Ethan Pyke and his family were recognized at the Champions of Inclusion Awards Celebration for their involvement with the Best Buddies program at Leo Hayes high school. Theresa Pyke’s son Ethan has taught her more than just an air guitar solo. “Everyone has the right to be included,” said Pyke. “If I didn’t have him, I don’t know if I would have discovered that.” Ethan, 23, was born with autism spectrum disorder, an intellectual disability that causes him to be non-verbal. In high school, Ethan became involved with Best Buddies, a non-profit organization that creates opportunities for one-to-one friendships, integrated employment and leadership development for people with intellectual and developmental disabilities at Leo Hayes High School. “We have met the most incredible people because of Ethan, who I know I wouldn’t have met otherwise,” said Pyke, who said her son also enjoys listening to country music including the Road Hammers, and playing music on his air guitar. local organization as well. “It changed his world. The most important thing is he has friends,” said an emotional Pyke. Ethan, his parents and four siblings will be recognized with a Champion of Inclusion Award by the New Brunswick Association for Community Living for their avid involvement in the Best Buddies program at Leo Hayes High School. The family became involved with the program, after Ethan, the eldest sibling took part in the program back in high school. The New Brunswick Association for Community Living is a charitable organization that works on behalf of children and adults with an intellectual disability and their families and has 12 local associations across the province. A Sobeys store in Bathurst will receive a Champion of Inclusion Award for employing people with a disability for more than 15 years. Sean Gibbs, a teacher and coach at Riverview High School in Moncton, will receive an award for his inclusion of two Grade 12 students with disabilities in his outdoor pursuits course. The Champions of Inclusion Awards celebration took place Friday night at the Crowne Plaza in Fredericton. “It’s a really good opportunity to recognize people who really do take the lead and through their own leadership, also inspire others to be their own champions of inclusion through their example,” said Christy McLean, manager of communications for the New Brunswick Association for Community Living. inclusion in this province,” said Phil Ouellette, a member of the New Brunswick Association for Community Living board and master of ceremonies. stronger by including everyone,” said McLean.